Advanced tire design and advanced tire molding technology combine to make the Eagle GT+4 the performance radial you can count on even when the weather takes a turn for the worse. High lateral sidewall stiffness produces responsive handling characteristics, but with a fairly firm ride. Crisscrossing tread design achieves rain sweeping efficiency and adds lateral biting edges for improved traction on snow covered roads. 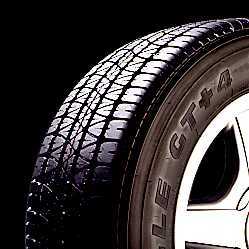 Performance handling, high mileage, year-round traction - think how your car will perform on tires like these. The tread pattern may vary from the photo depending on the size and speedrating.